Val Mesdi…… Wow!! What can I say about this one. Pretty bloody amazing to be honest. 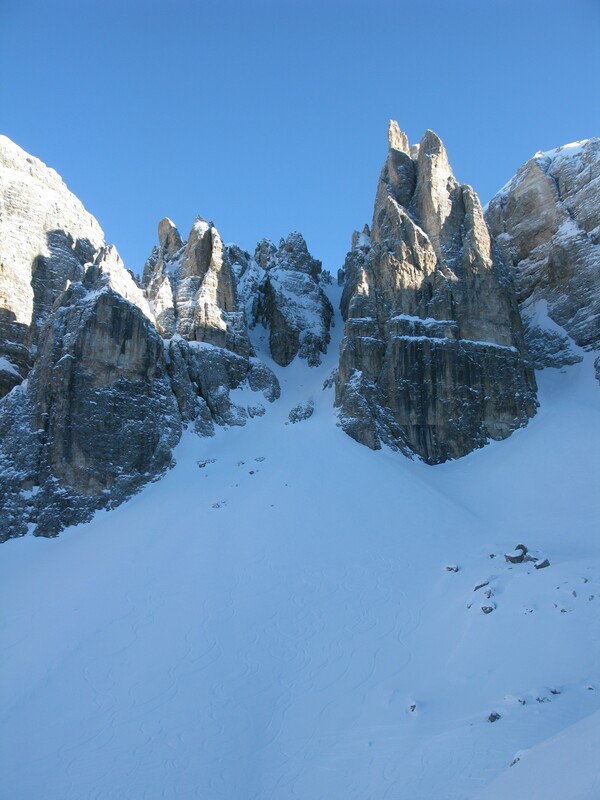 It has got to be an absolute classic in the Dolomites and definitely a jaw-dropper from start to finish. Thank God there were no flies around. 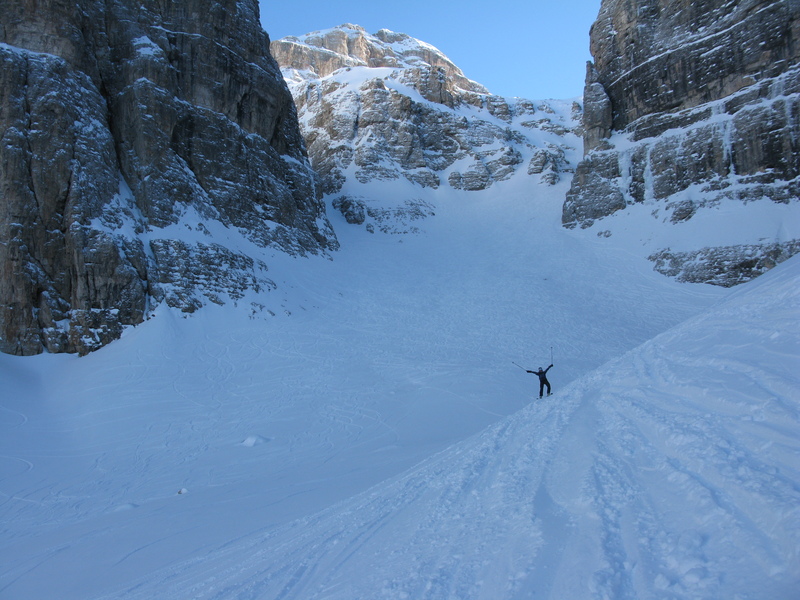 It’s one of the many routes you can do after taking the lift up from Passo Pordoi and I cannot recommend it enough. Nothing extreme or nasty about it. The entrance to the valley might be a little on the steep side for some (probably high 30s in degrees but it soon mellows and leads you into the valley itself. )……sheer rock walls all around you. Really, really beautiful, almost to the point where the skiing becomes secondary….but only almost. It probably takes around an hour to get to the entrance from leaving the Passo Pordoi lift (didn’t pay much attention to the time so that could be a little off but close enough). 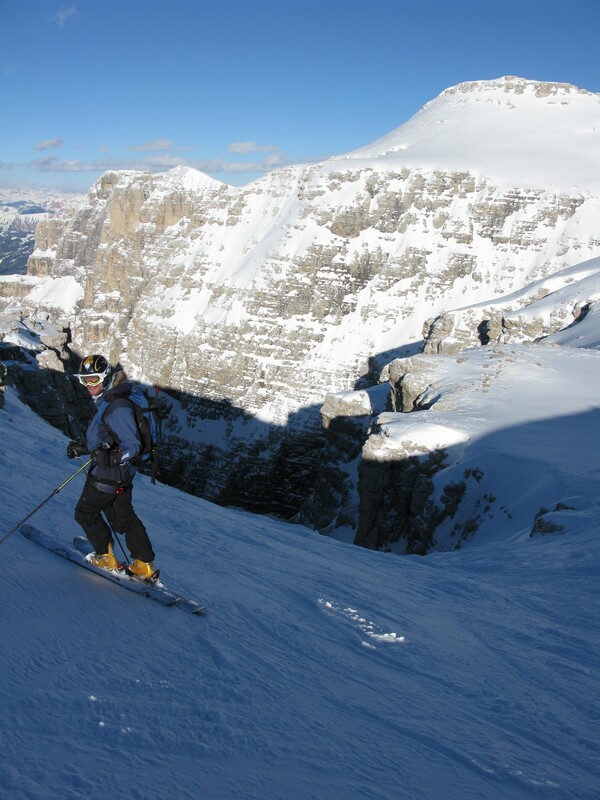 Just like Canale Col Alton, you have to head for Piz Boe and then keep skinning looker’s left (looking from Passo Pordoi). It should be pretty obvious. 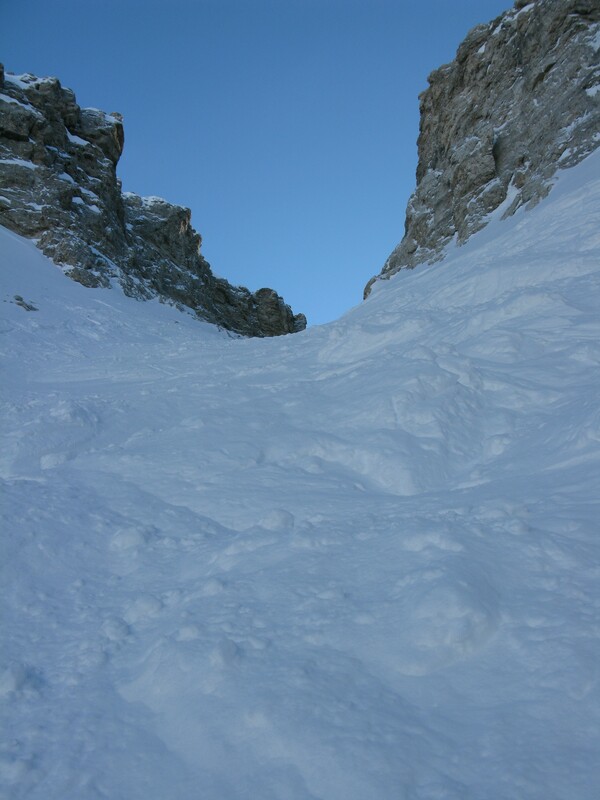 When we were there, there was an obvious skin track all the way across the base of Piz Boe which leads you to the entrance of the couloir. If you end up at the Boe refugio (which was closed when we were there), then you’ve gone the right way. 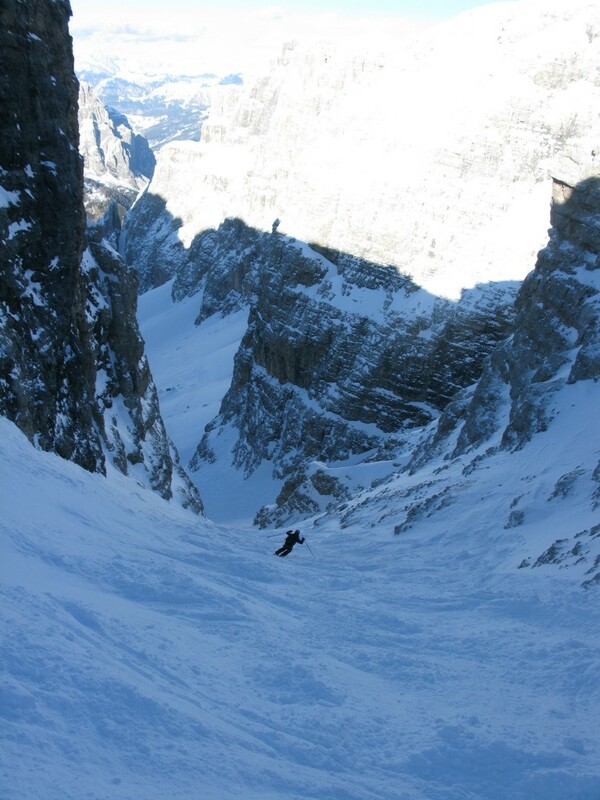 There are a few nice couloirs skier’s right when you ski down the valley. I will certainly have to check them out when I go back… and I will go back! Nice couloir for another day! You’ll know when you start to approach the exit, as the descent starts to get narrow. Head skier’s right and follow the tracks down or mogul field as it was in our case. 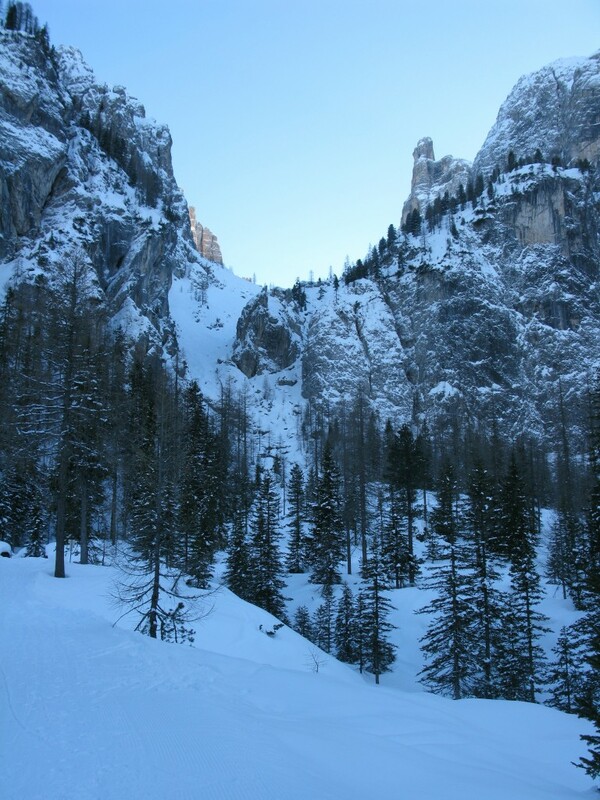 You’ll come out onto a track with just enough gradient to get you back onto the slopes in Colfosco. An absolute cracker! Skiing the Val Mesdi takes as long as you like but no more than 20 mins if you’re in a hurry. 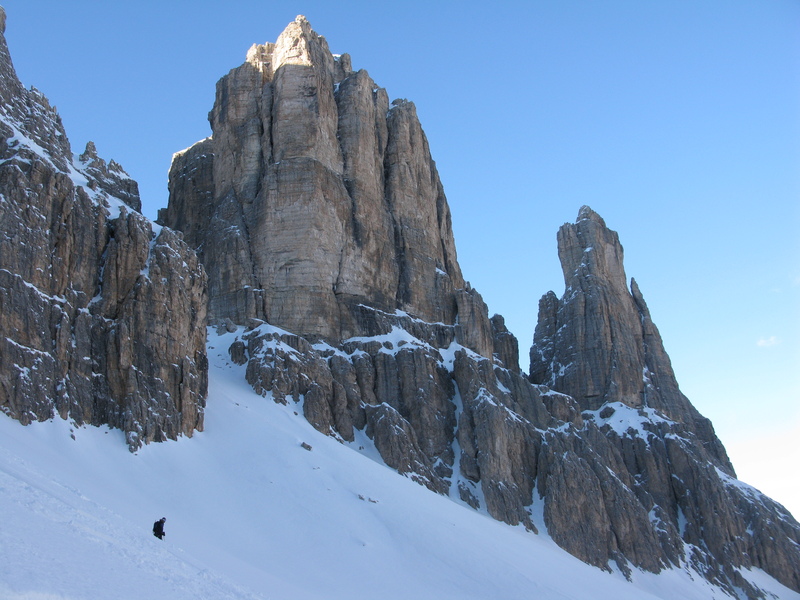 Once in Colfosco, we got a lift down to Corvara again and a taxi back to Arabba where we were staying. EUR 30 for the taxi for two if you’re interested. You can take the lifts back but they were closing when we arrived. Want to see more trip reports from Italy….? Click here. 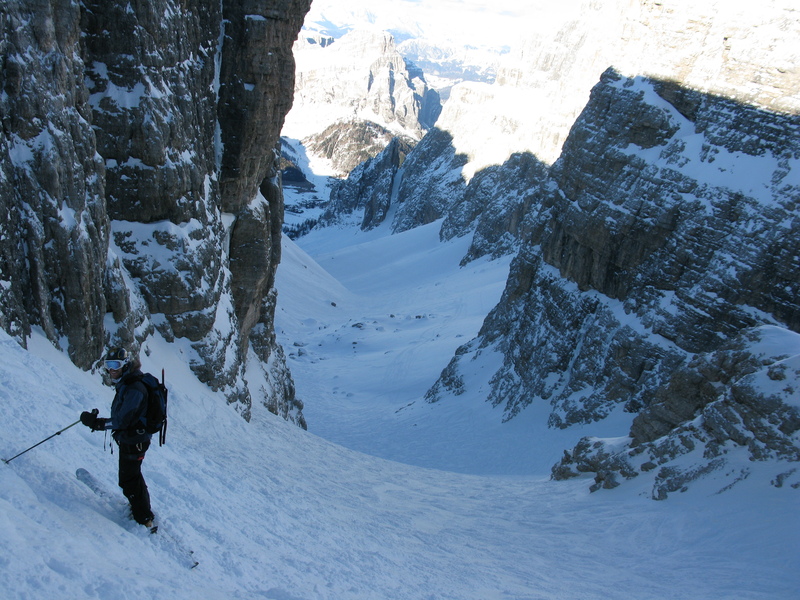 This entry was posted in Dolomites and tagged Backcountry skiing, Splitboarding, Val Mesdi. Bookmark the permalink.